UPDATE: Since this review was published, 5 Napkin Burger has closed. One too many gourmet burger spots in Atlanta, apparently. For a dieter, this is not a trend to be cheered. Like New York perhaps five years ago, it can now be safely said that Atlanta is overrun by gourmet burger joints. The phenomenon crossed from trend to outright saturation when a national chain recently opened in the epicenter of Atlanta’s gay neighborhood. A 5 Napkin Burger now sits at 10th and Piedmont in Midtown, surrounded by the gay bookstore, a men’s day spa, one of the most popular gay bars in town, a cool coffee shop and a popular breakfast joint that’s a walkable distance for the nearby condo dwellers who’ve been out late. The Atlanta location follows the chain’s colonization of New York (with three locations), Boston’s Back Bay and Miami’s South Beach. And those restaurants were borrowing a page from culinary stars such as Daniel Bouloud, the French chef who introduced the world’s most expensive hamburger at his DB Bistro Moderne in New York in 2001. The $27 burger (now $32) comes stuffed with foie gras, truffles and braised short ribs. We stumbled into the place after the theater not long after and had our burgers with airy pomme soufflés. By the wee hours of the morning, that decadent burger was a raging heartburn. 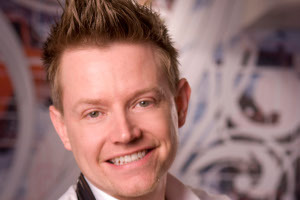 5 Napkin’s recent opening merely cements the trend, but in Atlanta one would have to date the beginning to celebrity chef’s Richard Blais‘ Flip Burger boutique in December 2008. Others certainly noticed his success with burgers. Atlanta has added Yeah! Burger from chef Shaun Doty, with locations in Midtown and Virginia-Highland; Farm Burger with locations in Decatur and Buckhead; and Grindhouse Killer Burgers in Midtown and downtown. The list of adjectives applied to the beef at these restaurants is extensive. Natural, organic, grass-fed, certified humane, black diamond, 100 percent certified angus, dry-aged and even carbon-neutral. Just reading the menu can leave one exhausted, especially considering that it’s still a hamburger and no better nutritionally than a quarter pounder at McDonald’s. Needless to say, with such highfalutin burgers as the stars, all of these restaurants also specialize in French fries and their kin, sometimes (as at Flip Burger) fried in duck fat. At Yeah! Burger recently, a companion was aghast to receive fried sweet potato wedges dusted with both salt AND sugar. There is no warning on the menu — only a boast of their being gluten free — so she sent them back. Though a dieter may not cheer this burger trend, he or she is unlikely to dodge it. Friends and companions will certainly want to go, and they will insist that there’s something on the menu for you as well. The restaurants have all vaguely heard of dieters, and some are better than others at offering accommodations. Typically these are a turkey burger, a chicken breast sandwich, a veggie burger, a salad. 5 Napkin probably offers the most. The menu is extensive, with five entree salads and an ahi tuna burger — even some sushi. None of those items, of course, are dieter friendly without some modification. One has to insist on the creamy chipolte or creamy honey-lime vinaigrette on the side. The ahi tuna has to be ordered without the tempura fried onions and with the wasabi mayo on the side. The menu at Yeah! Burger — exclamation point theirs, by the way — offers three salads. One is that most classic of non-diet salads: the Caesar. A pretty typical nutritional tally is 167 calories and 13 grams of fat, with only 1.38 grams of fiber. Another is a Cobb salad, which becomes diet friendly only if one changes the dressing and eliminates the bacon, blue cheese. The avocado and egg certainly add fat, but at least it’s the good kind. Yeah! Burger’s simple greens salad is decently fresh. To the usual ingredients, the kitchen adds crunchy radishes and sunflower sprouts. With the herb-lemon vinaigrette or the buttermilk dressing on the side and carefully controlled, a dieter can manage. 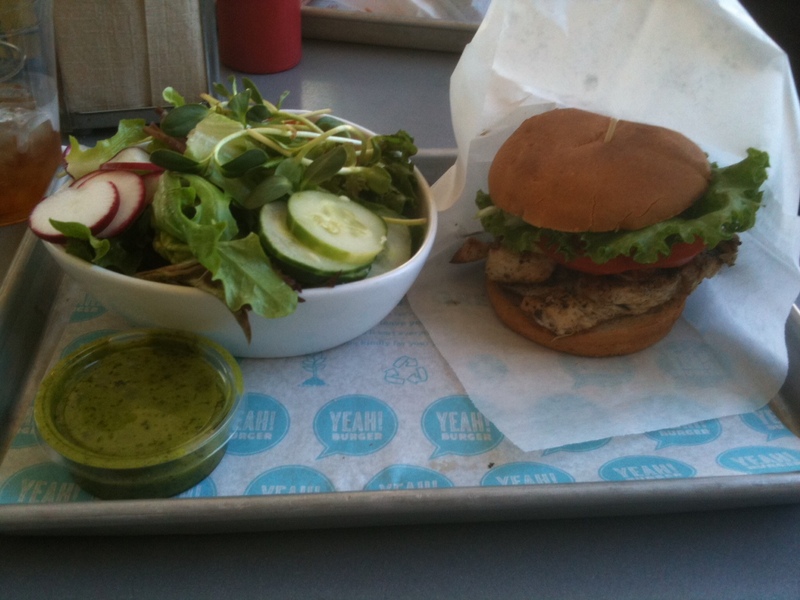 Likewise with the lone salad on the menu at Farm Burger. Drawing from what’s available locally, it often features radishes or other vegetables. The $3 version is too small; I find it necessary to get the $7 large. It is served with — on the side — a choice of dressings, a farm goddess dressing and a grainy mustard vinaigrette. The latter is freshly made on site. Most misleading on these menus is the poultry offering. Any experienced dieter knows there’s a considerable difference between a turkey burger made with meat from the whole bird and one made with pure, white, breast meat. Four ounces of ground turkey is about 193 calories and 11 grams of fat; the same amount of ground breast meat is about 120 calories and 1.5 grams of fat. Routinely, servers and counter staff at these restaurants cannot seem to answer the question, “Is it all white meat or not?” The best you’ll get is a mumble about the meat’s being organic. Assume you’re getting the meat from the whole bird, because breast meat does dry out when cooked. That leaves the turkey burger marginally better than just throwing in the towel and getting beef. Ground round (15 percent fat) clocks at 204 calories and 12 grams of fat. On our recent visit to Yeah! Burger, I opted for the chicken breast sandwich on the gluten free ($1.25 extra) bun. It had clearly been marinated in something, but wasn’t overly shiny. For those tracking calories, it probably amounts to the meat plus a couple teaspoons to a tablespoon of any fat. The menus won’t disclose it, but very often the buns are slathered with butter and toasted. The dieter is going to have to ask and request the butter be left off. It may still arrive with a bit of fat, owing to the fat that’s just sitting on the grill from previously toasted buns. Altogether, this is another food trend that masks the dietary horrors of fast food with a veneer of gourmet, organic, grass-fed, farm-to-table and locally sourced. And some of it tastes quite good. But don’t let all those adjectives fool you. It might as well be the McDonald’s drive-thru.